The world we live in, the technology that drives us, and the fun we have using it. A few days ago, my colleague and I got into an "energetic discussion". One of our clients was very gung-ho about adding tons of Slideshows to their new website. Unfortunately, this is a bad way to attract search engines, and an even worse way to keep interested potential clients on a website. "Tom, why did __________ hire you?" "Because they knew we were gonna build them a great website." "Do they trust your expertise?" "THEN WHY ARE YOU LETTING THEM TALK YOU INTO SOMETHING THAT IS GOING TO BE BAD FOR THEM?!?!? THEY ARE RELYING ON YOU TO BUILD SOMETHING THAT IS GOING TO BRING THEM MORE BUSINESS!! YOU ARE NOT DOING YOUR JOB IF YOU LET THEM GET THOSE SLIDESHOWS!!" Truth be told, he is 100% right! When a potential customer comes to a website, there is a certain expectation that they have, one that if not available, will be a barrier to doing business with the customer. Today I'm going to talk about a simple, 1,2,3 depth chart for your website, which is considered part of best practices for engaging your users and continuing them into the sales funnel that you are creating. Level 1: Home and Landing Pages - This is the place where your content should be clear, concise and abbreviated. If you are dazzling your first time visitors with slideshows or video, this is the best place to do it. Just make sure that the content is not overkill, with too much text, too many pictures, or too many moving items. It should be clean, crisp and easy to read, and most importantly, focuses the visitor in on just a few products, services or solutions that are your best sellers. Level 2: Category-level and summary pages - Once a visitor clicks through on a menu item, such as a list of services, they should see a decent number of the offerings from your business or organization. Even if it is a blog post, they should see a nice listing of the many blog posts that you have written for your audience. If it is an eCommerce site, you should have categories of items, that if the user clicks, will take them to the next logical level (subcategory) of items. Example: If I am on a clothing website, and I want to buy a pair of jeans, I might click on the jeans and then next expect to be seen some subcategories of jeans, such as loose fit, tight fit, etc. 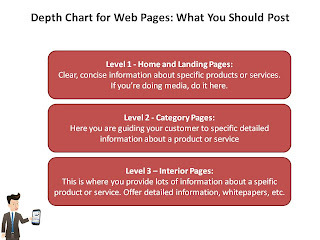 Level 3: Here is where the customer is looking for the bottom-line about a product, service, solution or even blog post. If they have navigated this far into your website, they are their to get very specific, very detailed information. It could be do-it-yourself guides, whitepapers or an explanation of your process used when taking care of clients. The main thing to remember is that here you are dealing with people that are looking for facts and figures. They are very close to calling you, buying something, or signing up. The post-script to this story is that I decided to go back to the client and negotiate with the client, giving them the reasons our developer laid out. Thankfully, based on his expertise that I was able to convey, the customer decided to move the slideshows to a place where it would not prevent their future users from clicking through and continuing the sales funnel. Please donate through the North Rockland Business Alliance page and Stony Point Town Hall, to help families affected by Hurricane Sandy. Our initial goal is $10,000.